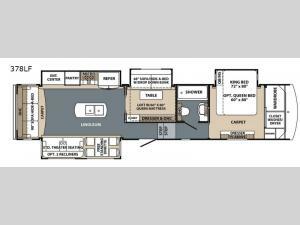 You can easily camp with your whole family or a few friends in this Cardinal Explorer 378LF fifth wheel by Forest River. In the kitchen you will enjoy features such as an island with a double sink and spacious pantry. Off of the kitchen area there is a bunk room with a 68" sofa/hide-a-bed with a drop down bunk. Above this room you will find a loft with a 60"x80" queen mattress. Mom and dad will enjoy the comforts in the front bedroom. Here there is a king bed, and along the front wall you will find a large wardrobe plus a closet that has been prepped for a washer and dryer, and more!